Paleontologists at LMU correct a case of misinterpretation: The first fossil "Archaeopteryx" to be discovered is actually a predatory dinosaur belonging to the anchiornithid family, which was previously known only from finds made in China. In the journal BMC Evolutionary Biology, Foth and Rauhut now report that this fossil differs in several important respects from the other known representatives of the genus Archaeopteryx. 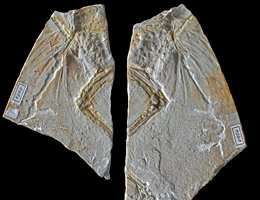 In fact, their taxonomic analysis displaces it from its alleged perch on the phylogenetic tree: "The Haarlem specimen is not a member of the Archaeopteryx clade," says Rauhut, a paleontologist in the Department of Earth and Environmental Sciences at LMU who is also affiliated with the Bavarian State Collections for Paleontology and Geology in Munich. Instead, the two scientists assign the fossil to a group of bird-like maniraptoran dinosaurs known as anchiornithids, which were first identified only a few years ago based on material found in China. These rather small dinosaurs possessed feathers on all four limbs, and they predate the appearance of Archaeopteryx. "The Haarlem fossil is the first member of this group found outside China. And together with Archaeopteryx, it is only the second species of bird-like dinosaur from the Jurassic discovered outside eastern Asia. This makes it even more of a rarity than the true specimens of Archaeopteryx," Rauhut says. The Haarlem specimen was found about 10 km to the northeast of the closest Archaeopteryx locality known (Schamhaupten) a full four years before the discovery of the skeleton that would introduce the Urvogel to the scientific world in 1861. Schamhaupten was once part of the so-called Solnhofen archipelago in the Altmühl Valley in southern Bavaria, the area from which all known specimens of the genus Archaeopteryx originated. Its taxonomic reassignment therefore provides new insights into the evolution of the bird-like dinosaurs in the Middle to Late Jurassic. "Our biogeographical analysis demonstrates that the group of dinosaurs that gave rise to birds originated in East Asia – all of the oldest finds have been made in China. As they expanded westward, they also reached the Solnhofen archipelago," says Christian Foth. Thus, the fossil hitherto incorrectly assigned to the genus Archaeopteryx must have been one of the first members of the group to arrive in Europe. Around 150 million years ago, the area known today as the Altmühl Valley was dotted with the coral and sponge reefs and lagoons of the Solnhofen archipelago, and the open sea lay to the West and South. The Haarlem fossil was originally recovered from what was then the eastern end of the archipelago, quite close to the mainland. Unlike Archaeopteryx, anchiornithids were unable to fly, and might not have been able to reach areas further offshore. On the other hand, all true fossils of Archaeopteryx found so far were recovered from the lithographic limestone strata further to the west, closer to the open sea. Based on the new findings, Rauhut argues that other known Archaeopteryx fossils may need reassessment: "Not every bird-like fossil that turns up in the fine-grained limestones around Solnhofen need necessarily be a specimen of Archaeopteryx," he points out. The authors of the new study have proposed that the Haarlem specimen be assigned to a new genus, for which they suggest the name Ostromia – in honor of the American paleontologist John Ostrom, who first identified the fossil as a theropod dinosaur.